Uponor Pex Repipe – The World’s First, Best, And Most Widely Used System For Single Family Homes And Residential Units. Uponor Pex plumbing systems feature PEX-a tubing, which is considered the superior PEX tubing manufacturing method in the industry. PEX-a is the most flexible of all PEX types, and because of its shape and thermal memory, it can use ProPEX expansion fittings which are the only fitting system that actually gets stronger over time – making it highly leak resistant. 1) Repiping in a home begins at the transition point. 2) The transition point is the point where the potable water system enters the building from the exterior of the building. 3) Repiping a potable water system means you totally abandon the existing potable system and replace it with a new system. 4) The first step in repiping your home is masking or “covering” the floors, and this must be completed before the walls are masked off. This overlap “enveloped” system allows the plastic sheeting to be rolled up in one continuous motion. 5) Cutting the sheetrock: You will be shocked at how little sheetrock has to be removed for the layout and installation of a new potable water system. A real Pex Plumber is an expert at HVAC, framing, plumbing, and electrical layout, and will lay out the home pex repipe in the most effective route. The better the repiper, the smaller and fewer the drywall holes! 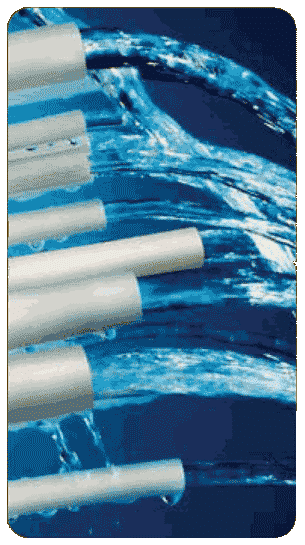 6) A “GREEN REPIPE” potable water system refers to a Pex repipe potable system only – such as UPONOR or ZURN with corrosion resistant fittings. CPVC and copper systems are not green systems. 7) The drywall pieces that are removed must be used in the patching process as each texture is a little different in thickness. This gives you a uniform surface thickness as you start the repair process. Each piece goes back in the hole it came from. 9) Repipe inspections must be performed by the local building inspectors after the repipe is completed, with the system under full water pressure. 10) The signed inspection card must be given to the homeowner after the PEX repipe inspection is completed. 11) Drywall repair begins after all the necessary backing has been installed. Backing supports the drywall pieces that were removed to access the potable water pipes and accommodate the repiping of a new Pex repipe or copper potable water system. 12) The fiberglass mesh tape must be used 100% of the time. 13) The patches must be pre-filled with quick set patching compound. The compound comes in 18lb bags, and because it is a powder, it must be mixed with water. This locks the perimeter of each patch and will make the area of the patch stronger than it was before the work process began. The reason this is important is that when you close the doors in the house, the walls flex just a little bit, and if you do not perform this method of repair, the patch will fracture over time from the flex/vibration caused by shutting the doors. 14) Do not coat the drywall patches with regular all-purpose joint compound on the repipe patches.This is a common practice and the patches will crack later 100% of the time, even if it’s years later. 15) Coat all the repipe drywall patches with quick set patching compound only. USG will do and you can find it at any home and hardware store, or you will have fractures in the walls at the patch locations. 16) Float all the walls with quick set patching compound and use a 12″ drywall knife and stagger each coat until the walls become smooth and flat. The next step is wet sanding the patches and this must be done if you want the patches to blend in perfectly after the texture is applied. The reason you’ve seen bad patches in the past is that repairmen do not know how to “kill the edges.” This is an old drywall term that means you must do the detail wet sanding work and there is no short cut. 18) Paint to match the existing paint. All repipe companies color match the same way. They run down to their local hardware store and have the computer color matching done by the man behind the counter. This is beginner color matching. The proper way to color match is hand color matching. First, match the paint sheen. Second, computer match for the base color. Third, tint for color adjustment. Fourth, match the color and sheen after the paint sample has dried. Repeat if necessary. Did you know that the paint color on the wall after it dries will be different than the paint color while it is wet and in the can? 19) If you follow the basic repiping rules, after a very short time you will not be able to point out all the drywall patches from the repair. You will simply forget where the holes were due to the patches receiving the proper floating, texture and painting techniques. Your friends, neighbors, relatives, and even plumbing contractors will not be able to find the patches. 20) This is a basic guideline for a home repipe, and if done, properly you will have a repipe that was done as well as a repipe can be done. Call us Toll-Free 877-473-7473 We're here to help!